When heavy gauge steel is formed, coolant is used because of the tremendous force and friction is involved. At work, we have green coolant. 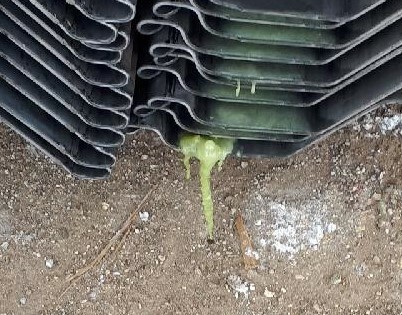 It is now very cold outside, so when we move the material out, any leftover coolant freezes just like water. The other day, conditions were perfect for a green “snot-sickle” to form on the edge of a piece of piling. We thought it was funny enough to snap a picture. It sure looked real to me. what’s that ace ventura line when’s he’s holding the fish, yummmmmmmmmmmy! I had to re-read that because I thought you were talking about me, not heavy gauge steel. As you were.